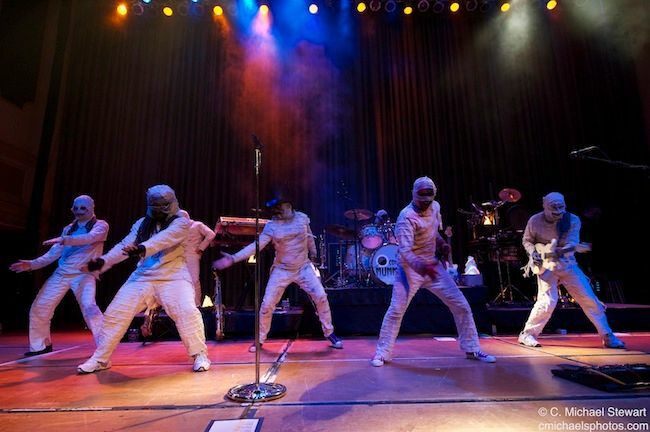 Here Come the Mummies is a Funk/R&B band, best known for their live performances in which band members perform in full mummy attire bandages. It consists of various professional musicians based in Nashville, Tennessee. There are rumored to be several Grammy awards among the members, though this is difficult to verify, as the identities of band members are kept "under wraps." Members are believed to be under contract to various record labels, hiding their identities so as to prevent contract disputes while performing. They have performed at venues primarily in the South & Midwest.